Most of us remember the pleas from our parents and grandparents to “eat your spinach so you’ll grow big and tall.” They weren’t far off. Spinach is one of the world’s healthiest vegetables: it’s packed with vitamins, minerals (especially iron and calcium), carotenoids (beta-carotene, lutein, and zeaxanthin), fibre and a host of other phytonutrients. Good food is medicine, and spinach is the perfect example. Studies suggest this leafy green vegetable has anti-cancer, antioxidant, and anti-inflammatory properties. 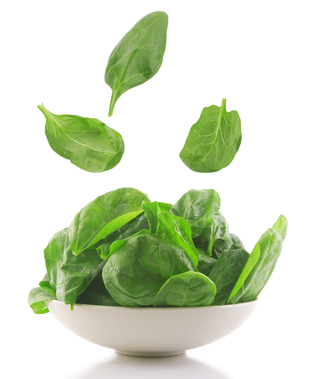 Spinach may also reduce your chance of cataracts and loss of eyesight as you age. Popeye maintained his strength eating spinach (and spitting out the can), but what the cartoon didn’t show you was that he was also protecting himself against inflammation, oxidative stress-related problems, heart disease, bone problems, and cancers at the same time!